Our tension force sensors are extremely compact, but yet in a very robust design. The force is generally applied through external threads (also avail­able with rod ends) or by means of connecting straps. The sensors provide standardized analog, unreinforced strain gauge bridge output signals in mV/V. As an option, some of our tension force sensors can be supplied with an extended temperature range of -40°C up to 150°C. Typical applications for these sensor types are for example, rope or spring force measurement, examination of operating forces, determi­na­tion of force in belt tensioners or bowden cables, … . Our compression force sensors, with only few exceptions, are designed low profile with a small diameter, so they are well suited for applications in confined spaces. 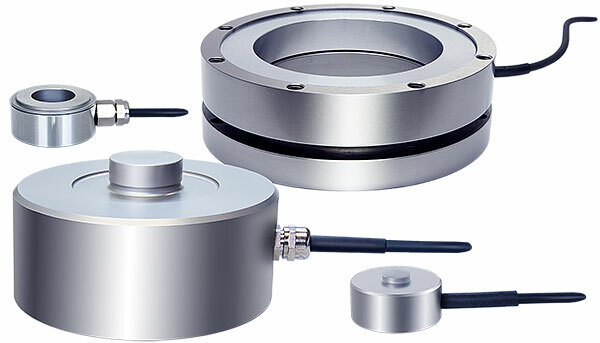 We manufacture compression force transducers with a spherical load application button, or ring force sensors which have a through-hole and are therefore particularly suited for the measurement of tension forces, or the implementation of mounting parts. As an option, many of our compression force sensors can be supplied with an extended temperature range of -40°C up to 150°C. For the protection against damages, caused by impermissibly high com­pression stress, our compression force sensor type K-13B, for example, is supplied with an integrated mechanical stop for overload protection by default. Typical applications for these sensor types are for example shear force and press-in force measurement, measurement of preload forces in screws, industrial process monitoring during force fitting, joining, riv­et­ing, stamping, … . 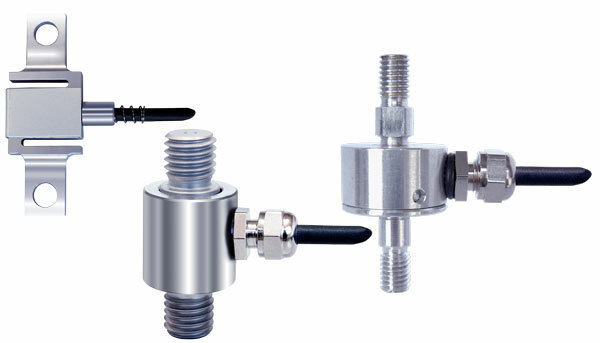 We also provide an extensive range of tension and compression force sensors. Three different types are available: load cells with internal or external threads, S-type force sensors and flat sized force transducers. For example, our universal precision force sensor, type K-11, high-pre­ci­sion, extremely compact, easy to install and with standardized nominal value, can be optimally integrated into existing systems. 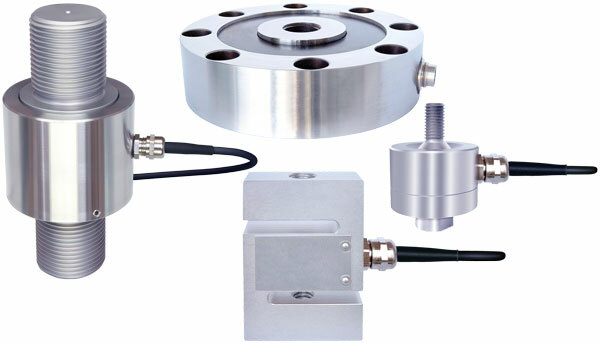 Or our low-cost, but yet highly accurate S beam load cell, type K-25, which is available in very small to medium measuring ranges and optionally (available up to 10 kN) provided with a mechanical stop as overload protection against dam­ages, caused by impermissibly high tensile and compressive forces. These sen­sors provide standardized analog, unreinforced strain gauge bridge output signals in mV/V. As an option, many of our tension and compression force sensors can be supplied with an extended temperature range of -40°C up to 150°C. 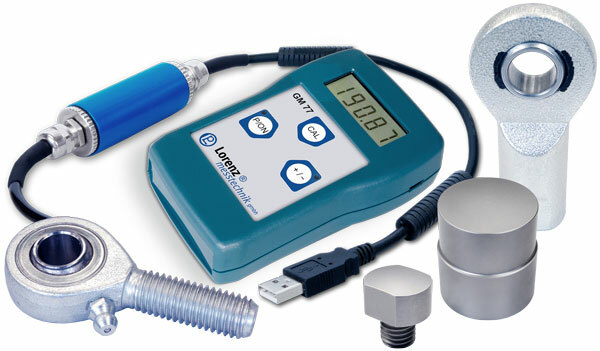 Typical applications for these sensor types are for example, material test­ing machines, rope or elastic force measurement, examination of oper­at­ing forces, determination of force in belt tensioners or bowden controls, industrial process monitoring at press-in, riveting, stamping, drawing op­er­ations, … . For our force sensors, we provide suitable force transmissions, con­nec­tion cables and much more, e.g. measuring amplifiers, such as sensor inter­faces for the conversion of the bridge output signals into standar­di­zed voltage or current signals for the connection to stan­dard interfaces; or measuring amplifiers with integrated displays for direct presentation of the measured values.